Animated STAR TREK - "The Infinite Vulcan"
PSA epilogue for "The Infinite Vulcan"
This episode mentioned (but did not show) the Kzinti race, which was a tie-in to Larry Niven's Known Space Universe. 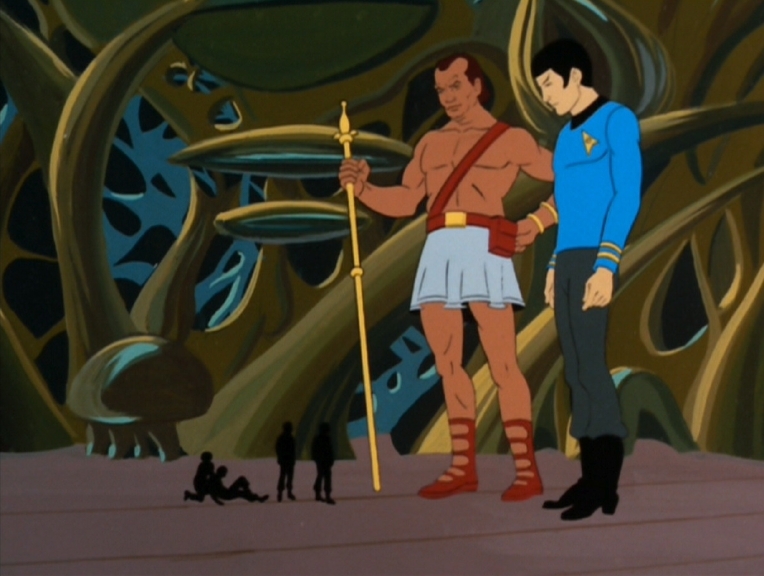 In fact, this episode was the first STAR TREK episode to cross-over with Niven's universe, as it was produced and aired before "The Slaver Weapon" which was a major cross-over. A Kzinti character also appeared in "The Time Trap" but he did not have any dialogue. This episode's writer, Walter Koenig (pictured), originally played Ensign Pavel Chekov on the Original STAR TREK series and also starred in the semi-regular role of Alfred Bester, the highly placed member of Earth's Psi Corps on Babylon 5. In this episode, Kirk referred to the concept of IDIC (Infinite Diversity in Infinite Combinations). The Vulcan IDIC symbol (pictured) was first seen in the original series episode "Is There In Truth No Beauty?" No explanation was given in the episode for the clones being 25 feet tall. 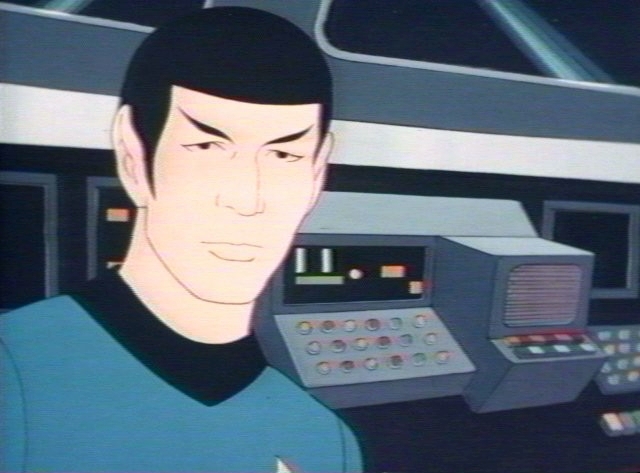 Like "Yesteryear" and several original series episodes, this animated episode centered on the Vulcan science officer Lieutenant Commander Spock, because his personality so sharply contrasted with the human norm. There is a page in this site that focuses on the Phylosian Ships that were seen in this episode. In this episode, flying plant creatures called swoopers menace the Enterprise landing party. 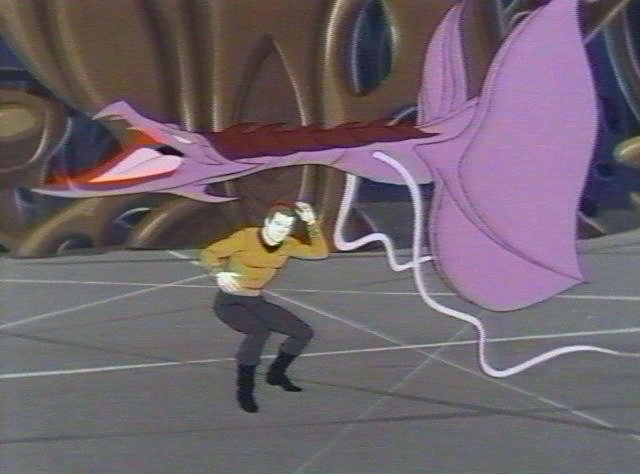 The animation drawings of the creature were reused by Filmation artists to create the purple flying lizard-like creatures that menaced the Enterprise landing party in "The Eye of the Beholder". Another example of similar life forms evolving on different planets. Either that, or the Lactrans took swoopers from Phylos for their zoo. 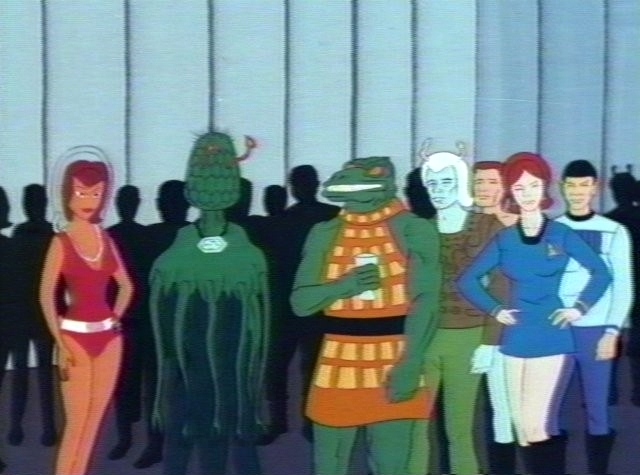 Phylosians were later seen in "The Time Trap". It seems that many years ago, a Phylosian ship became lost in the Delta Triangle region of space, and a Phylosian later sat on the Elysian Council in that limbo realm. In this episode, Spock states that the Phylosians "...used almost 70% of their brains - a very high ratio." The 10-percent-of-the-brain myth rears its ugly head in the script of this 1973 episode. The belief that modern humans "use only 10% of their brains" is a very popular misconception and is quite an old myth. There is no scientific evidence that humans don't use 100% of their brain's potential. In 1936, the famous adventurer and journalist Lowell Thomas attributed the 10-percent-of-the-brain claim to William James in the preface he wrote to one of the best-selling self-help books of all time, Dale Carnegie's How to Win Friends and Influence People. For some reason, Nichelle Nichols provided the voice for the U.S.S. 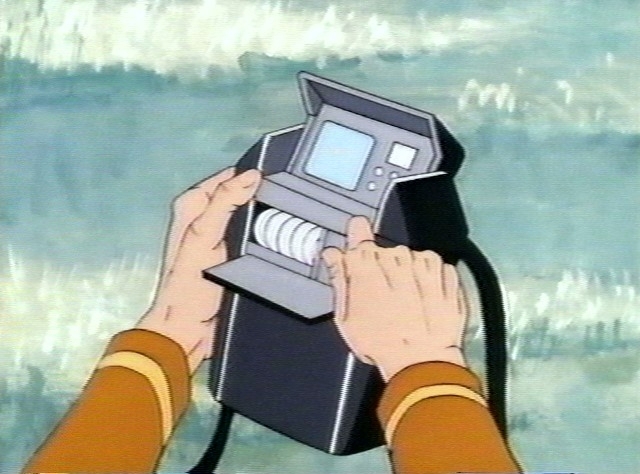 Enterprise computer in this episode and in "The Lorelei Signal." The voice of the Enterprise's computer in the Animated STAR TREK series was usually provided by Majel Barrett. She also voiced the main computer in the original series, STAR TREK: The Next Generation, STAR TREK: Deep Space Nine and STAR TREK: Voyager. "The Infinite Vulcan" was novelized by Alan Dean Foster in Star Trek Log Two published by Ballantine Books in September 1974. Also novelized in the book was "The Survivor" and "The Lorelei Signal".